One of the major goals of neuroscience is to be able to switch brain cells on and off in a non-invasive way. It could help patients with a whole host of disorders, from Alzheimer's to PTSD. This is one of the main drivers behind the field of optogenetics, which is a biological technique where light is used to control the activity of brain cells in living animals . Optogenetics received some press recently with a study from Yale University which showed how researchers had managed to turn on the "killer instinct" in mice, to make them attack inanimate objects the way they jump on food. Neuroscientist and PhD student Dheeraj Roy helped us understand how it works using a playground analogy. If the cell is the playground, the proteins are the gate entrance to the playground — they control what comes in and what goes out. And these gate-keeper proteins can be stimulated by various things, like chemicals or light. The field of optogenetics can be traced back to the early 1990s, when German biologist Peter Hegemann was working with the algae Chlamydomonas reinhardtii which he found would wag its "tail" and move forward when exposed to light. I.e. : the protein gates opened and allowed the algae to perform a certain function because of the light. By the late 1990s, scientists had started to realise that there could be some important uses to this, and so a decade of research began to try and find the gene that reacted to light. Several years and many studies later, a landmark paper in 2005 showed how researchers found the protein in a particular single-celled algae called ChR2 that only responded to blue wavelengths of light. White light as we see it is comprised of all the various different light spectrums, including blue. When the protein was removed, the algae no longer moved under sunlight. However, when the same protein was then inserted into a mouse brain cell in a petri dish, the channels opened, and neurotransmitters started transmitting under pulses of blue light. 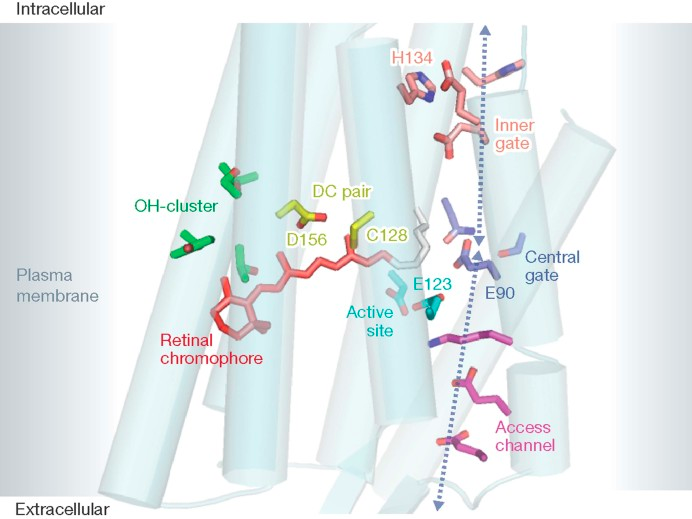 Now researchers knew they could polarise animal cells with light when they had this special protein, and thus began research of inserting ChR2 into the retinas of blind mice, hippocampal neurons, the spines of living chicken embryos, mouse brain slices and parasitic worms. Before this breakthrough discovery, Roy said nobody in the neuroscience field had a good way of controlling neurons — at least not at a reasonable timescale. "Most things would be some chemical or drug, but typically after infusing part of the brain you're interested in studying, it would either take place in a number of hours, or it would just last for too long to make a very concrete conclusion," he said. Over a decade later, science has advanced further, and researchers are now controlling even finer things than cells, such as DNA molecules. "People dream that we can one day use it in patients," Roy said. Currently, most optogenetics research takes place in animals like mice . Normally, when you teach an animal to be scared of a box by giving them an electric shock to the foot when they enter, it will remember this for at least a year and will avoid at any cost going inside that box. Mice with amnesia, on the other hand, quickly forget what happened to them in the scary box and start acting as if nothing bad had happened as little as a month later. "These traumatic memories are important to remember... that's why most of us do as well as we do," Roy said. "So my question was, what are we seeing here, because a lot of the idea behind memory loss means we are actually losing this memory information." However, Roy said this theory has always been more of a "good guess," and his research set out see whether memories could in fact be recovered . Around 100 neurons in the mouse hippocampus — the part of the brain responsible for emotion and memory — are responsible for this type of memory, so Roy's team attempted to artificially turn on these cells with pulses of blue light. "What we found, which was striking for us and for the field, was when you artificially use optogenetics to turn on these cells, we could get the animals to show fear," Roy said. "So these animals were amnesic yesterday and now whenever we put them back and turn light on, they're fearful. They look exactly like control mice." In other words, the research suggested for the first time that just because a memory is forgotten, it doesn't mean it's lost forever, and may even be able to be retrieved. This turned the field upside down in a way because it hadn't really been considered that the memories were still there. Now, many research groups want to build on this knowledge. For example, some groups are looking at studying brain disorders like schizophrenia, where patients sometimes have trouble remembering things. People with autism often have the opposite problem. They remember things too well, and so they have trouble letting go of traumatic experiences, and small things that happen every day. Still, it's important to remember that these experiments are all happening in animal models. No experiments with optogenetics have been done on humans in this way. The only optogenetics trials in humans have been limited to experiments on the eye , rather than directly on the brain. "Today's optogenetics is quite invasive and so if we ever want to move from animals to humans, it has to be a different version at least," Roy said. "We're not going to be able to start drilling holes into the skulls of every patient, we'll have to come up with something more reasonable." Also, a lot more evidence of the human immune response to such treatments is required for the regulatory bodies to be on board with optogenetics. A research group at the Roth Lab at the University of Carolina at Chapel Hill led by Dr Bryan Roth is working on this. They've come up with something which Roy believes could be an exciting way of translating optogenetics research to a less-invasive approach. "He [Roth] came up with this tool called DREADDS," Roy explained. "The reason I like it is that even though optogenetics is really at the timescale of neurons communicating with each other, DREADDS allows you to do something similar." The idea is researchers can have control over neurons and so they can still turn them on or off , like in optogenetics. But instead of doing this with invasive laser beams in the brain, they do it with a drug. That drug "goes and finds your neurons that have this unique bio-receptor ... and it turns that on or off," Roy said. "Even though it's not as precise as optogenetics, I do see its power in being something very close to what optogenetics can do, and several-fold less invasive," Roy said.